Radiopaq has decided that the world needs more choice in its audio equipment, so has created the Custom Tuned Headphones, available in four different sonic flavours. 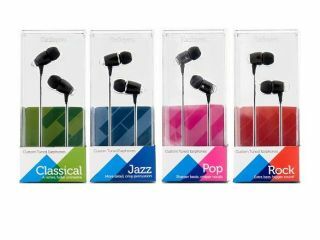 Rather than making a lovely selection of pretty colours, Radiopaq has chosen to make headphones tailored for styles of music; namely Pop, Rock, Classic and Rock. Each set of headphones has a slightly tweaked set of hardware in the tiny chassis to give a different sound profile, using an 11-piece chamber to achieve this. For instance, the Jazz set will have a stronger focus on rhythm and pace, where Pop will have a stronger vocal set-up up but with less balance on the high end of the sound spectrum. These headphones will retail at £60 per set, which means you're unlikely to buy all four to have a set to suit your tastes. But John Whitehead, technology manager for Radiopaq, told TechRadar that he believed users who preferred a certain type of music, for instance classical which has a very balanced sonic set-up, would like to hear other types of music in this way, as it's more of a personal preference than a set of headphones for each musical occasion. Radiopaq is also releasing the Sound Jacket and Sound Mix accessories for the iPod and other 3.5mm-enabled audio players respectively, designed to re-enhance sound that has lost some of its quality through being compressed into an MP3. The Sound Mix and Sound Jacket will be available from the end of Q2 for £79 and TechRadar will bring you more details on these shiny little gizmos as and when we get them.